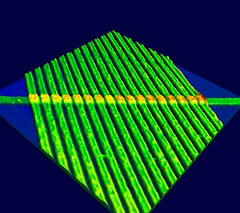 Atomic force microscope images of 17 HP Labs non-linear devices in a row, each a pair of oxide layers between the single bottom wire and one of the top wires. “The devices act as ‘memory resistors’ [memristors], with the resistance of each device depending on the amount of charge that has moved through each one,” Stanley Williams director of HP’s quantum systems lab, told Electronics Weekly. The wires are 50nm – about 150 atoms – wide. 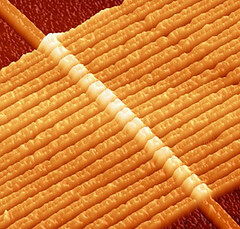 ‘Missing link’ memristor created: Rewrite the textbooks? This entry was posted in Technology and tagged circuits, 電通量, 電路學, 電子學, 被動元件, flux, fundamental components, Hewlett Packard, HP Labs, Leon Chua, memristor, R. Stanley Williams, shrink, University of California at Berkeley, 惠普實驗室, 憶阻器. Bookmark the permalink.